Shades of Bending Light is Matt Borghi & Michael Teager's second studio recording and the follow-up to 2013's critically-acclaimed Convocation. Recorded in one take without overdubs, Shades... shows the synthesized guitar and saxophone duo venturing deeper into their "jambient" style which brings together improvised ambient soundscapes from musical ideas created on the spot. Building upon the momentum and trajectory of Convocation and Awaken..., this album features more involved melodic and rhythmic interplay between Borghi & Teager. Fans of Tangerine Dream's Phaedra, Vangellis's Blade Runner soundtrack, Jeff Beck's Blow by Blow, and Tortoise will immediately recognize these influences on Shades of Bending Light. Purchase digitally via iTunes, Amazon, and eMusic. "Combining the intellectual heft of Jazz and Ambient Music with the appeal of New Age/Contemporary Instrumental Borghi & Teager highlight a range of different tonal modes and musical moods... Their genre strives to lift our inner lives, and [they] are right up there among the best." - From Chuck van Zyl at Star's End, full article here. 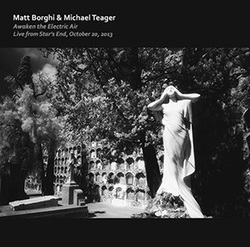 Matt Borghi & Michael Teager‘s Awaken the Electric Air: Live from Star’s End, October 20, 2013 is the duo's first live album. The music on this CD comprises renditions of several selections from Convocation, as well as new compositions that include fresh performances by Teager on flute. Recorded live at Philadelphia’s WXPN in the World Café Live studio and housed in packaging that’s comprised of original photography by Star’s End host and veteran electronic musician Chuck van Zyl. Our brief time in Philly was magical and welcoming; it’s satisfying that we were able to truly represent these special moments musically, and with the help of Echoes producer Jeff Towne the recordings are superb. We’re proud of this performance and happy to make this available to the public. The album is available for purchase digitally via iTunes, Amazon, and eMusic. "In their serious play Borghi & Teager lift the audience to a different place. A night time companion, small of gesture, large of heart, this album is subtle and in places moving - as it rescues us from the darkest corners of our own hearts." From Chuck van Zyl at Star's End, full article here. "Awaken the Electric – Live from Star’s End, is in part to hear welcome vestiges of Hassell’s tried and true Fourth World, from the plaintive melodic line to the slow-motion tribal pace, but it is also to hear those same sounds seeking to make peace with the current era. The result is a fascinating aesthetic feedback loop: something from the past taking root in and attempting to sound of the present. And on those terms, the music succeeds." From Disquiet.com, full article here. 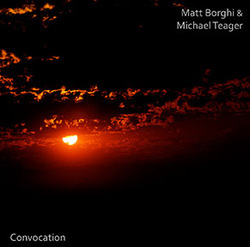 Convocation is the work of ambient composer Matt Borghi and saxophonist Michael Teager. Recorded as a series of improvisational structures in spring of 2012, this is the first recording that Borghi and Teager have done together after a half-decade of working together. With Convocation, Borghi brings in spacious guitar textures to create a harmonic fabric for Teager to lay out his saxophone playing with subtlety and nuance. With a background in classical and jazz saxophone, Teager brings a wide palette of influences to the music. Listeners will hear aspects of Jan Garbarek, John Coltrane and Dave Liebman that are juxtaposed over Borghi’s pastoral guitar sounds that have more of their timbral origins in the work of Claude Debussy or Ralph Vaughan-Williams than they do other contemporary ambient guitarists. Purchase via Amazon, iTunes, or eMusic. You can hear an excerpt of the recording below. – “Guitarist Matt Borghi and saxophonist Michael Teager have fashioned a wonderful ambient-styled recording that distinguishes itself dramatically from others in the genre.” - textura, Full article here. - "This album presents five gorgeous and languid soundworlds within which to drift." - Chuck van Zyl at Star's End, Full article here. – “I’m going to be very surprised if this doesn’t end up on a lot of ‘Best Of’ lists this year. You have to hear Convocation.” - Hypnagogue, Full article here. Convocation made Star’s End’s Top 15 for April, 2013.